Only half of our nation's minority students graduate from high school along with their peers. For many groups-Latino, black, or Native American males-graduation rates are even lower. As states hasten to institute higher standards and high-stakes tests in the effort to raise student achievement, this situation is likely to worsen, particularly among minority students. Yet this educational and civil rights crisis remains largely hidden from public view. The dropout problem is far worse than statistics indicate. Many states and districts simply do not count those students who fail to receive diplomas as dropouts. Even the hardest-hit urban districts report dropout rates of only 5-10 percent. In Dropouts in America, The Civil Rights Project reveals the scope of this hidden crisis, reviewing the most recent and accurate data on graduation and dropout rates, exploring the reasons that young people drop out of school, and presenting the most promising models for helping high school students graduate with their peers. 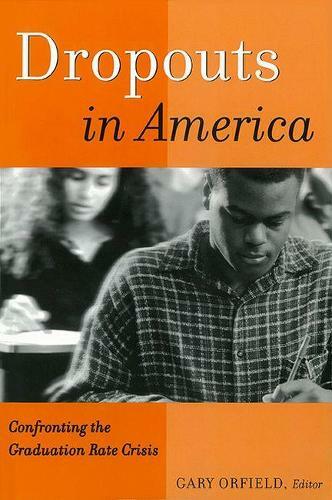 Dropouts in America is a call to action for educators, advocates, and policymakers alike, and an invaluable resource for those concerned with equal rights and the quality of American education. "Dropouts in America" can make an enormous difference in reducing the shamefully high level of school dropouts in communities across the country and make it far more likely that young students will graduate from high school and go on to college. Schools, communities, parents, and students alike can benefit from the promising models and concrete steps suggested here, and unlock the American dream for literally millions of the nation's youth. Senator Edward M. Kennedy, Senate Committee on Health, Education, Labor, and Pensions"
Gary Orfield and his colleagues have done us a great service by lifting the lid on one of the unacknowledged secrets of the recent drive for high-stakes tests and punitive sanctions in our public schools: an escalating dropout crisis that is seldom mentioned in the education circles of our nation s capital and one that is taking its highest toll on children of minorities." Dropouts in America" is an absolutely essential book timely, urgent, and disturbing. Jonathan Kozol, Author of "Ordinary Resurrections: Children in the Years of Hope and Savage Inequalities: Children in America s Schools ""